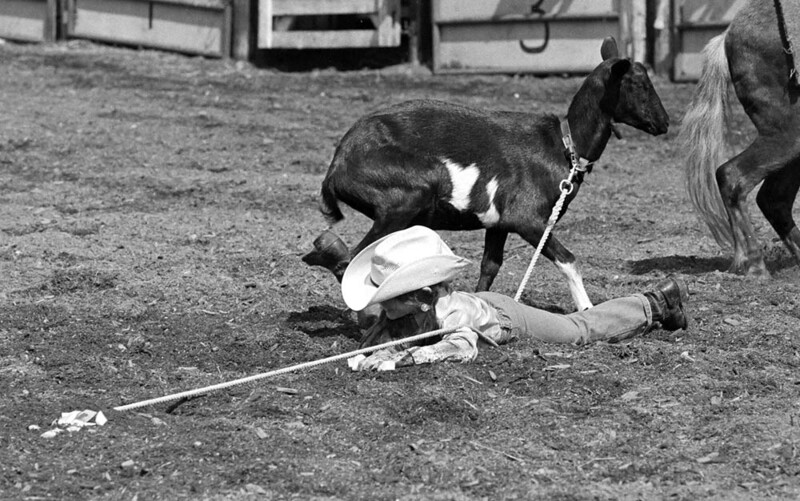 March 25th, 1970 — Rodeo clown Jerry Olson distracts bull #5 from trampling injured rider Ray Lundy of Coronation, Alberta during the Rodeo of Champions at the Edmonton Gardens. 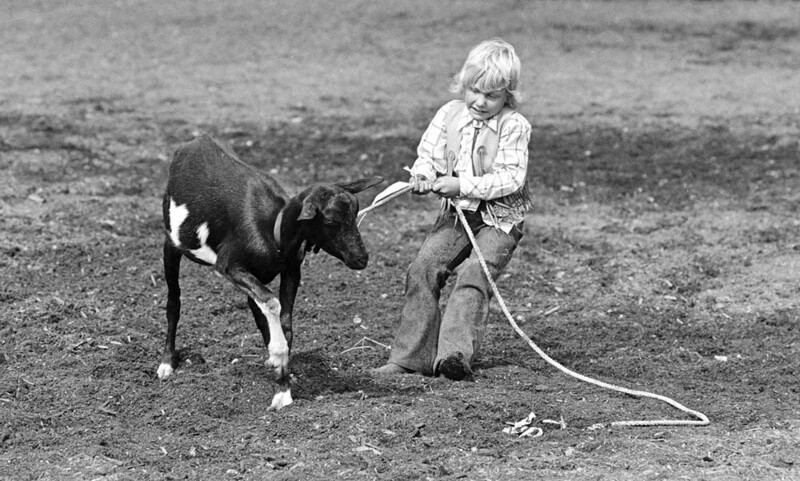 Olson was inducted into the rodeo hall of fame last year. 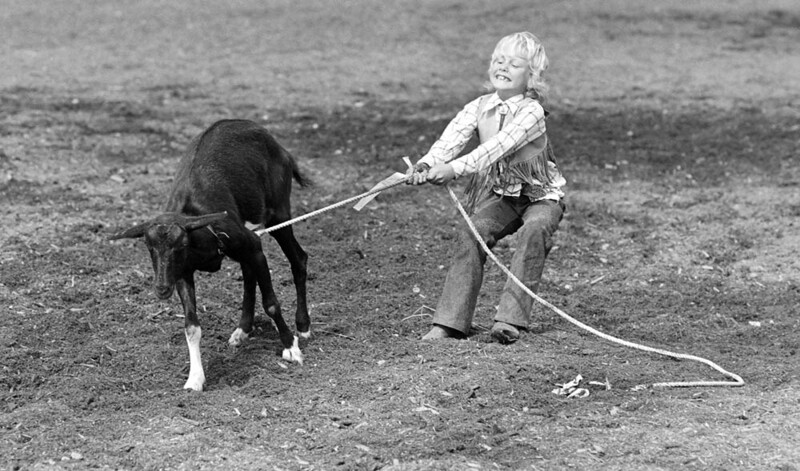 August 25th, 1975 — In 2008 pictures of Bobby Whitehead competing at the children’s rodeo in Langley were uploaded HERE. 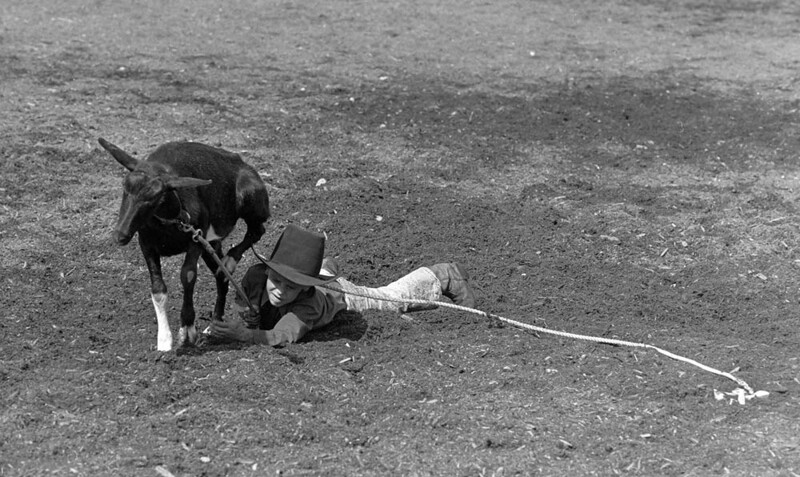 Recently the rest of the negatives from that assignment were discovered in my archives. 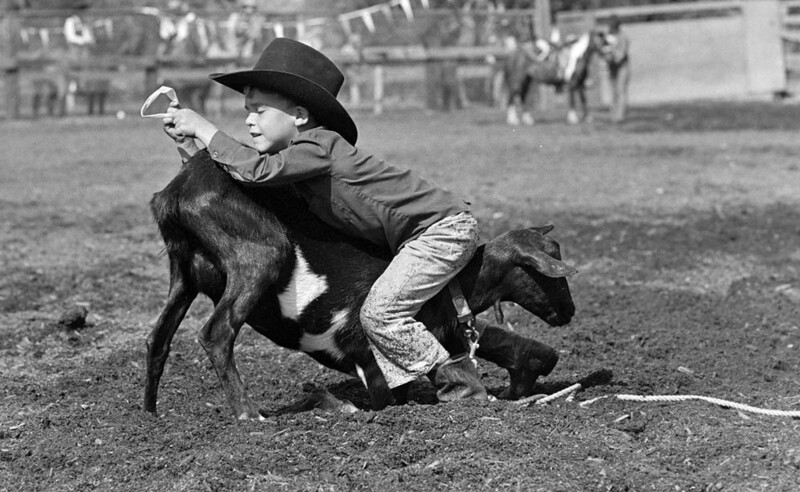 They show that Bobby wasn’t the only young cowboy having trouble that day. 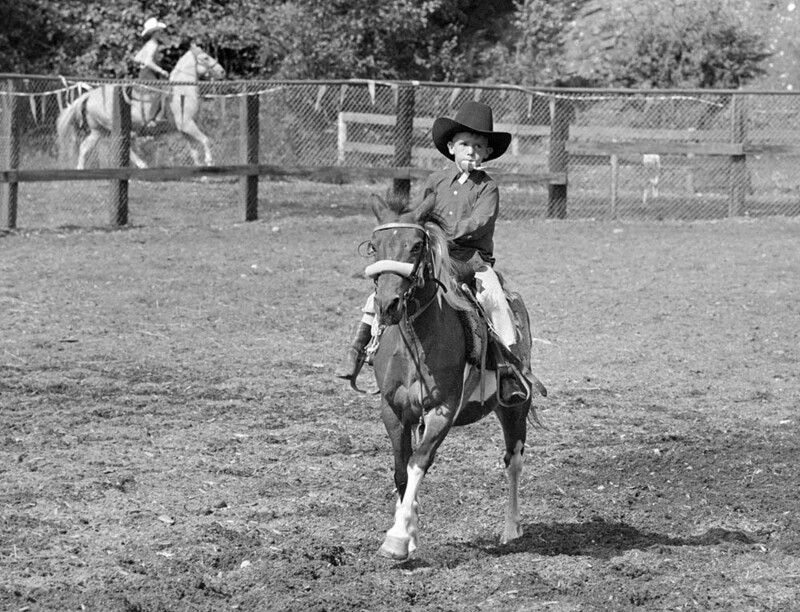 A selection are in the slide show below. 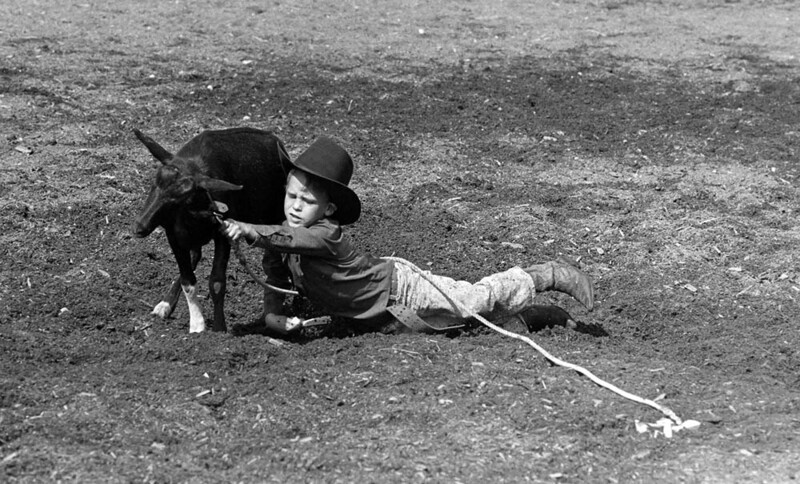 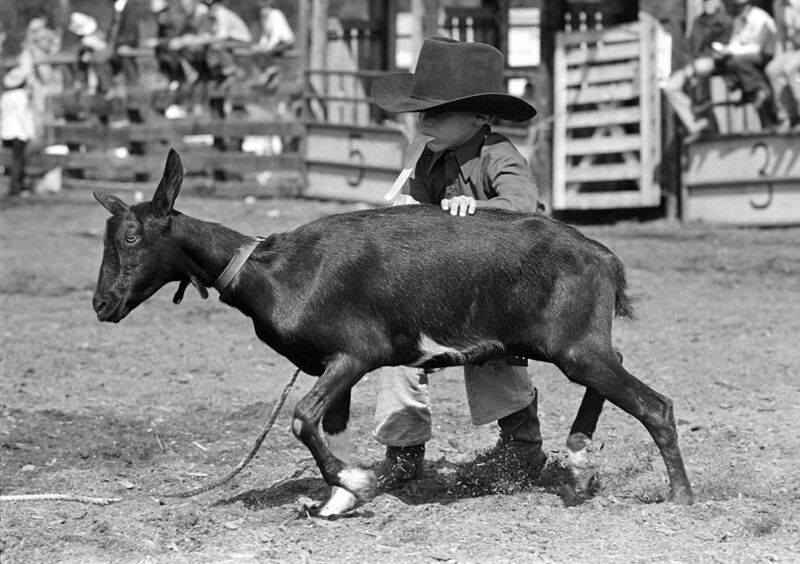 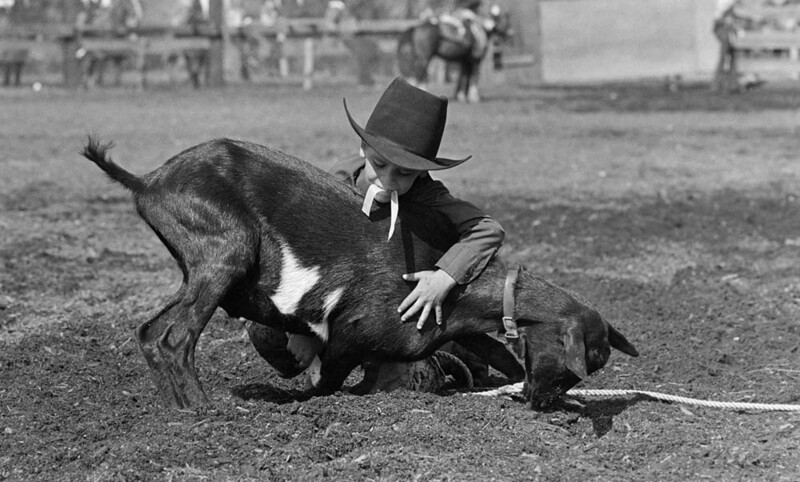 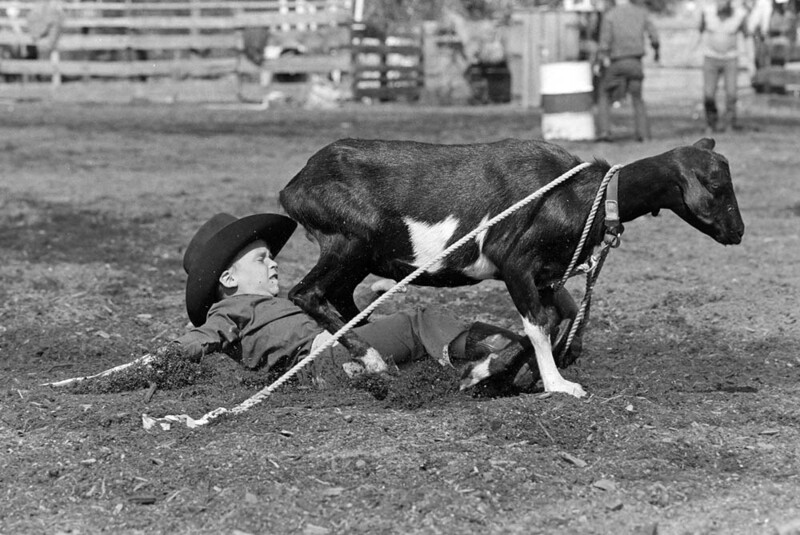 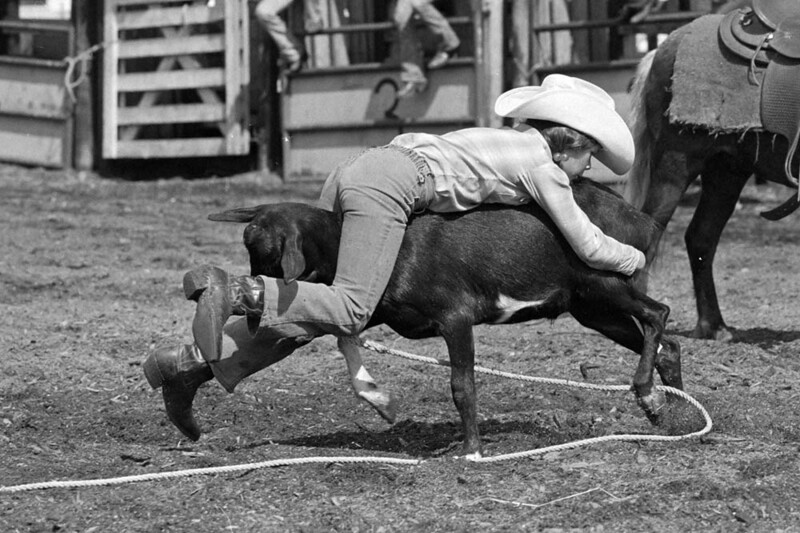 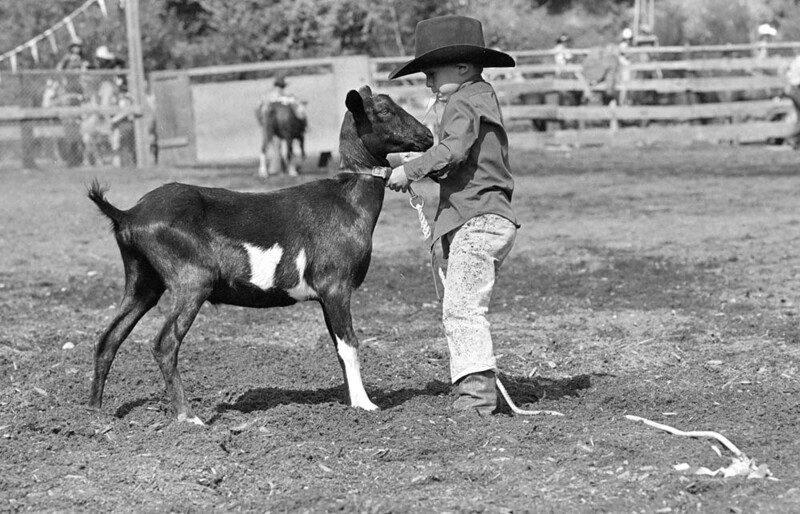 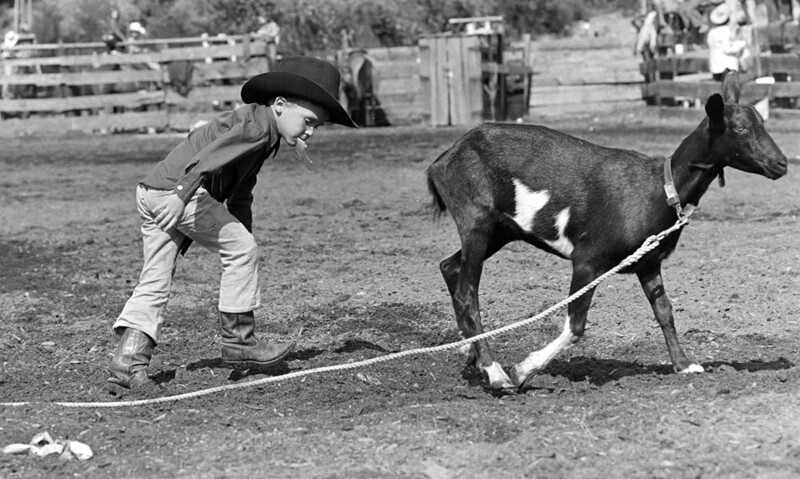 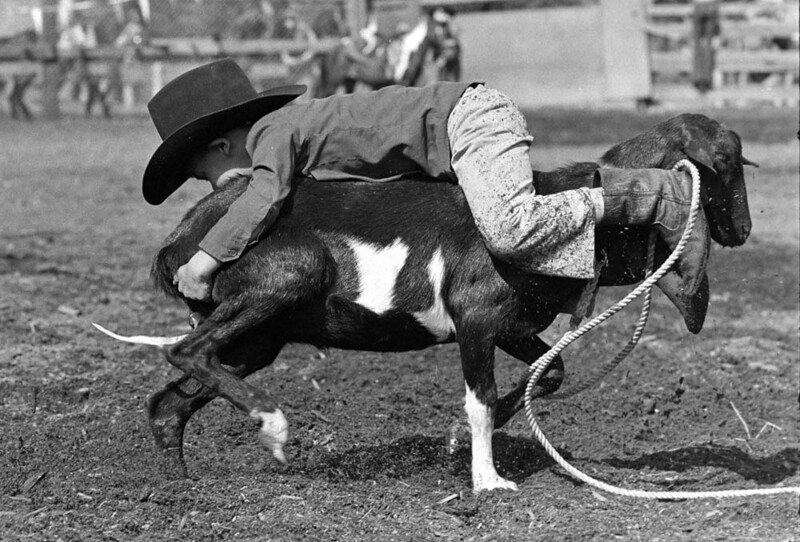 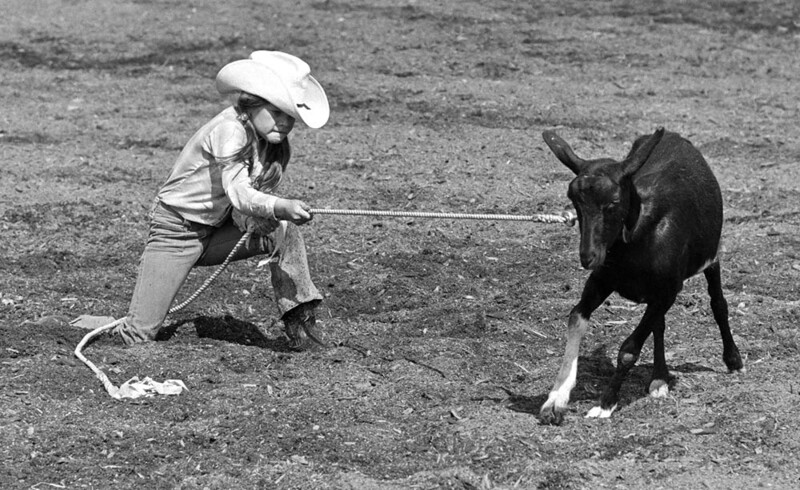 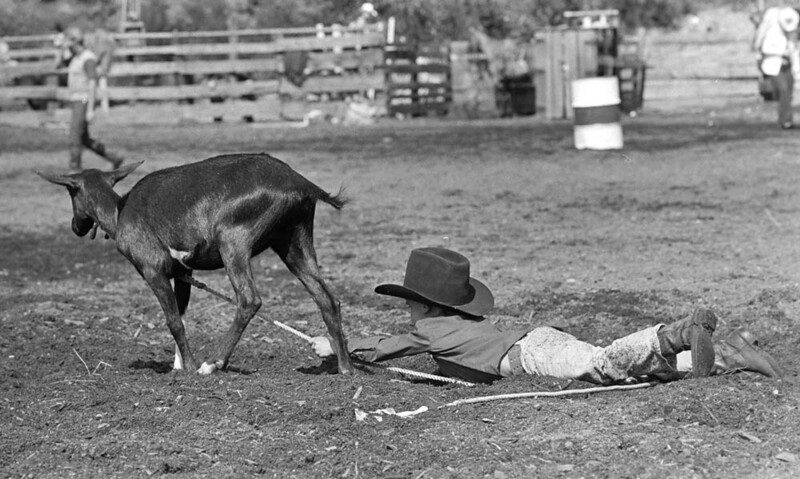 For those not familiar with this particular rodeo event the goal is to catch the goat and tie a ribbon on its tail. 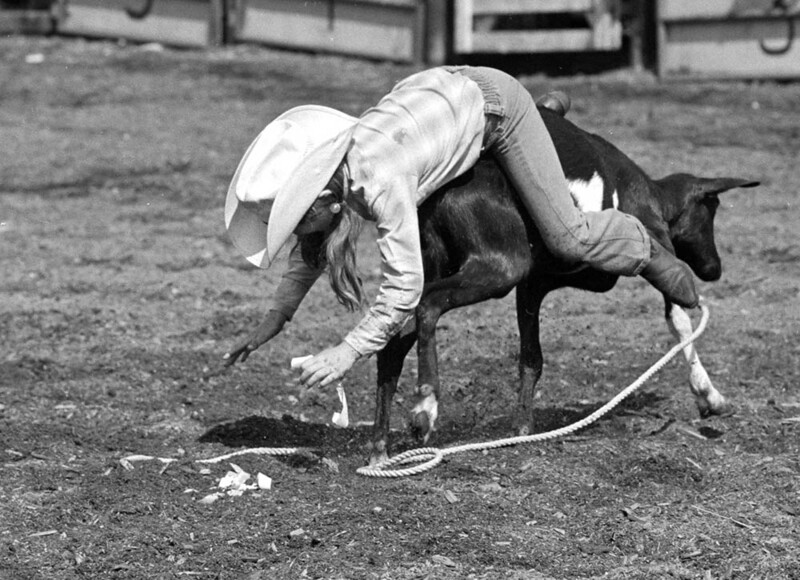 1970’s Edmonton — Kenny McLean during a saddle bronc riding event at the Canadian Rodeo Championships in Edmonton Alberta. 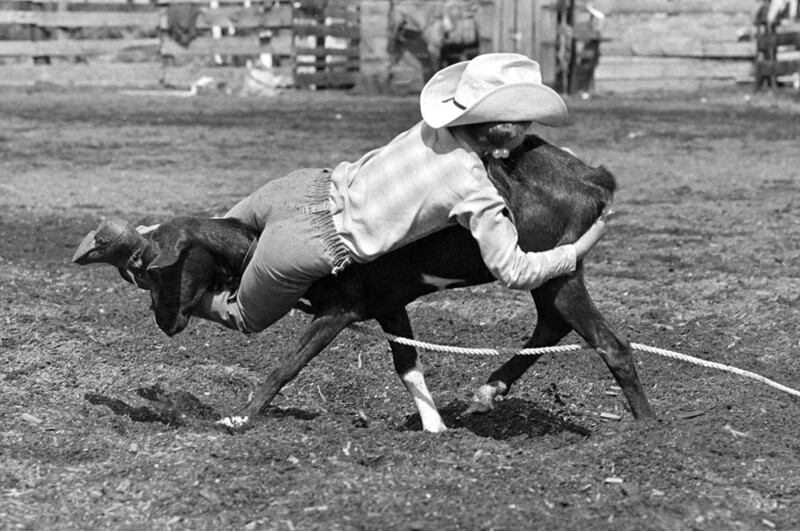 In 1962 McLean earned the title, world champion saddle bronc rider. 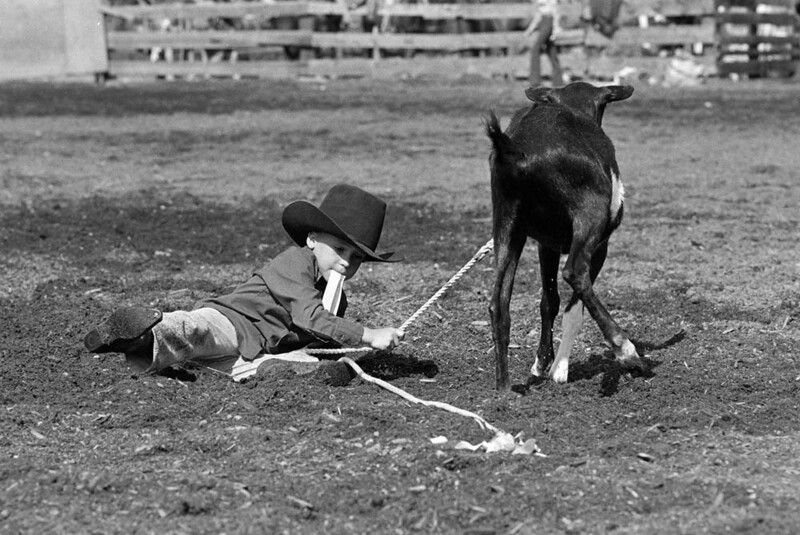 He also competed in calf roping and steer wrestling events and was inducted into the B.C. 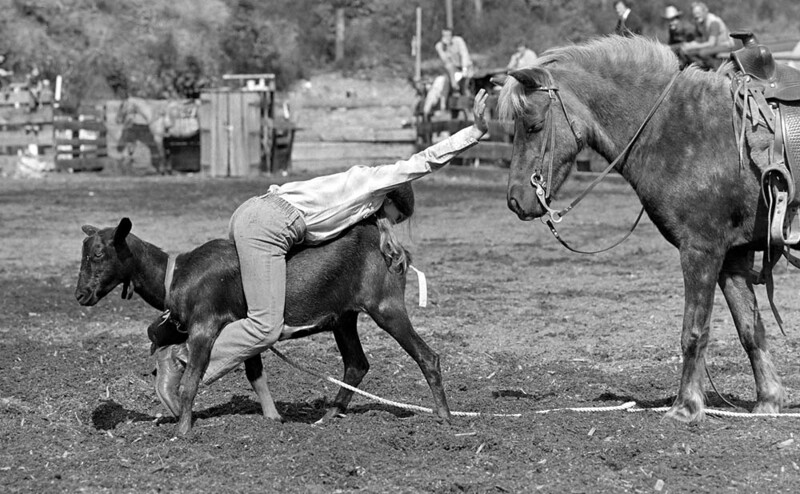 Sports Hall of Fame in 1974. 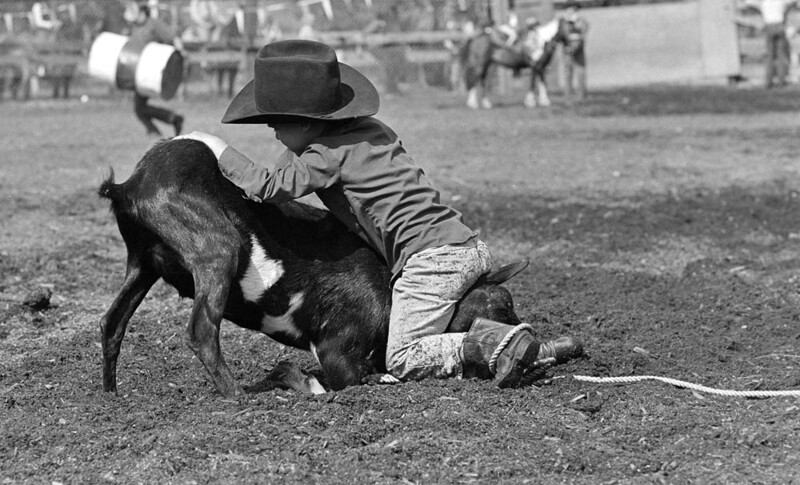 March 27th, 1972 — Edmonton — Rodeo always fascinated me as the cowboys were so casual about breaking bones; even more casual than motorcycle racers. 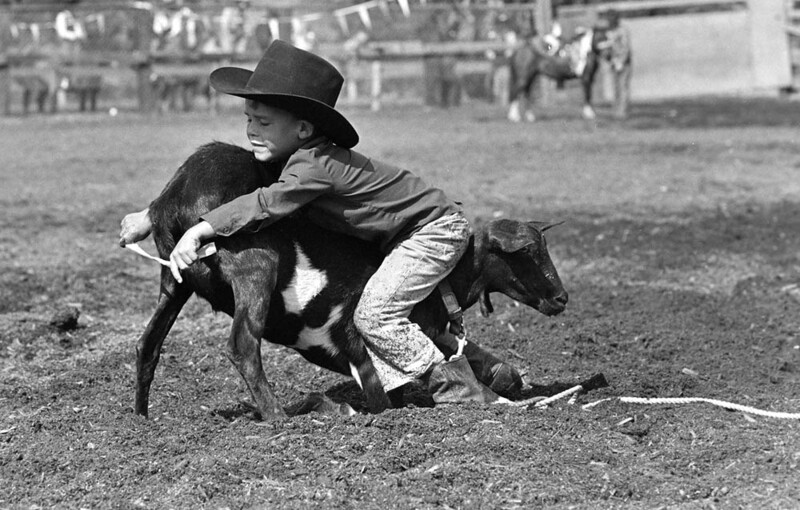 Because I was young and could run fast I was one of few photographers allowed in the ring during the bull riding events at the Canadian National Rodeo Championships in Edmonton. 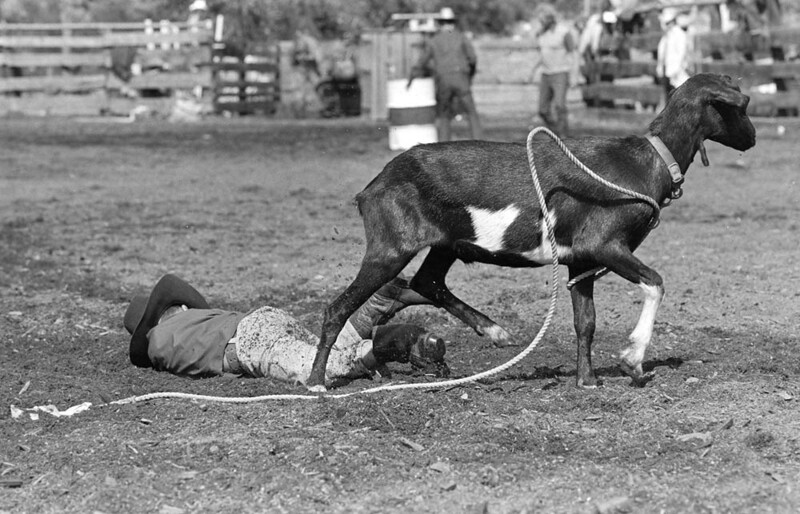 Being in the ring was the only way to get photographs like this one of rodeo clown Gerry Olson pulling the tail of a bull who had just dumped his rider. 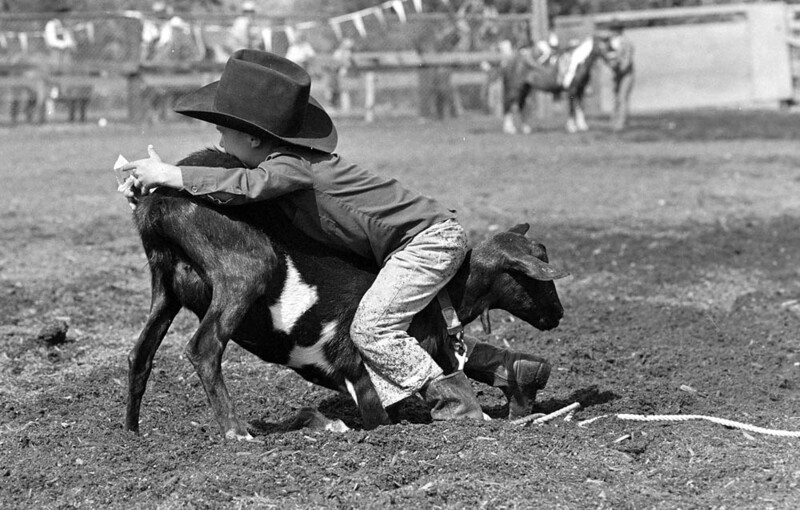 August 25th, 1975 — Some people will not grow up to be cowboys. 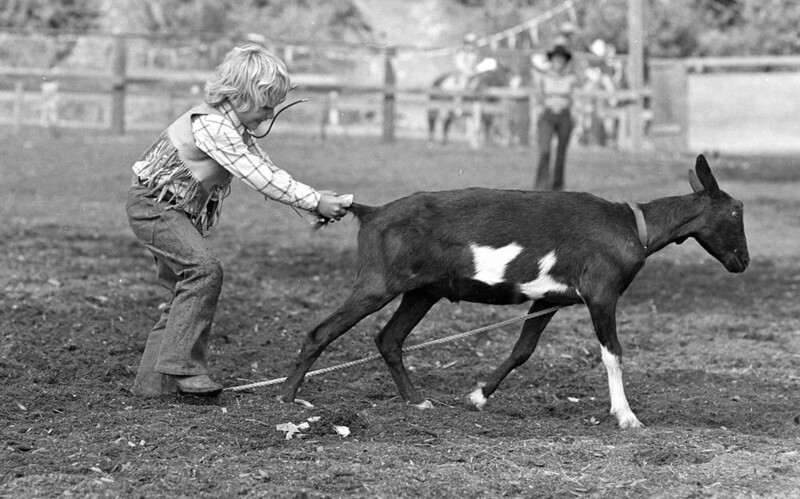 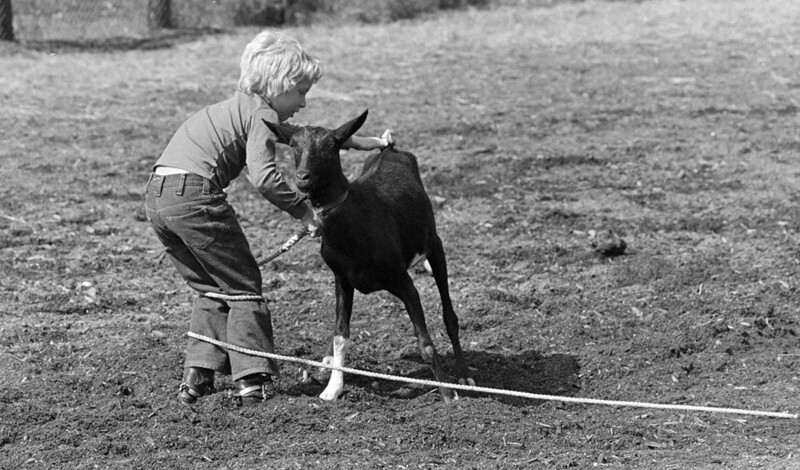 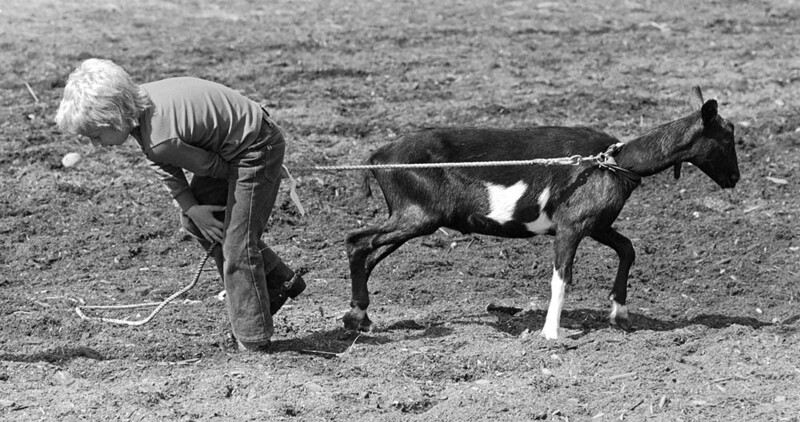 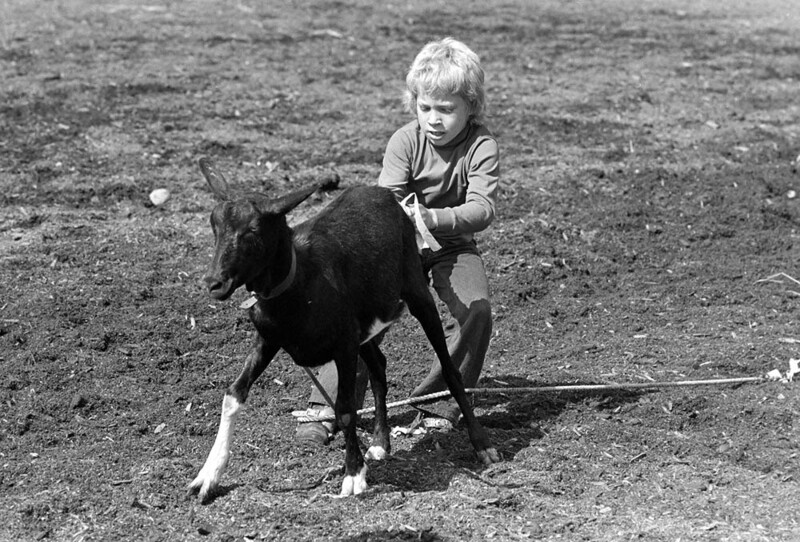 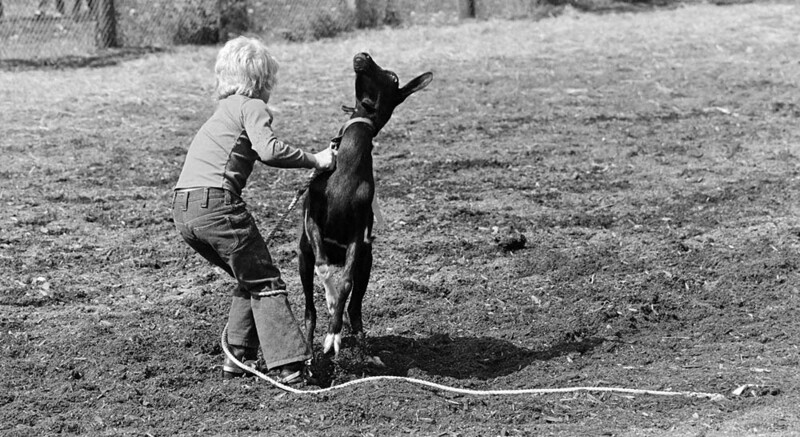 Bobby Whitehead is supposed to tie a ribbon around this goat’s tail but the goat has other ideas. 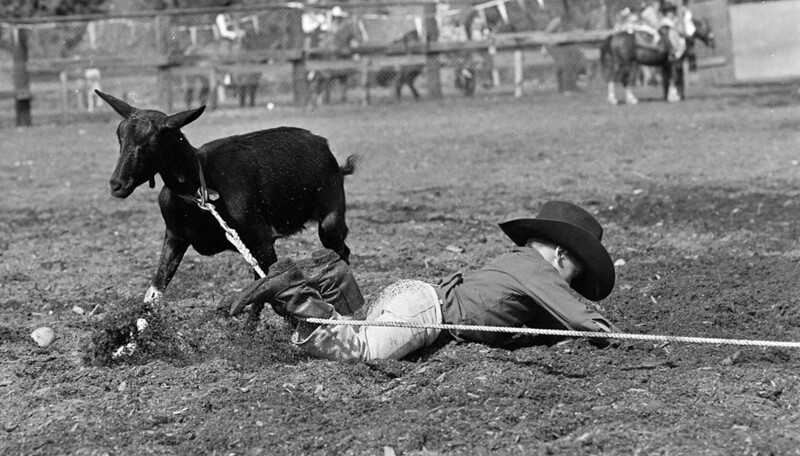 The picture was taken at a children’s rodeo in Langley.